Op-art after my own heart. A very nice size it is, too: B40/W32. It's only got a couple days left to run, so if you want it, click on the image to go to the auction. 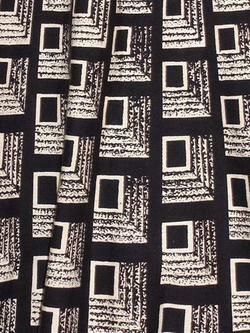 I also love how the print gets larger as it nears the hem of the skirt — what a great effect! It reminds me of one of my all-time favorite "idea dresses" (that is, dresses I have an idea for that I won't ever be able to make) — I want a dress with a print of Tetris blocks, dropping from the shoulders to make a border of nearly-completed rows around the hem. Wouldn't that rock? Obviously, it would have to be a '50s silhouette, as well, to get the full effect, and to reference the 1980s '50s revival that was going on about the time the game was invented. Now, if only someone would make that Tetris border print fabric for me, I could get to work on it. Still on the midriff theme. Don't Squeeze the … Bride? This isn’t just a dress, it’s high art! this was up on ebay a couple of months ago, i was mulling it over, and, surprisingly, _no one_ bid. it’s lovely. Oh God. This is briliant! well. guess no one bid cos many are afraid of trying not-e-typical-kinda. shame. Wow! That’s a fabulous dress!You just reminded me of all those hours spent playing tetris. Wow, that’s a fantastic dress, and for once, it’s actually in my size! *gasp* Though for $56 (the current amount), I’d really want to be able to try it on first…Now, when will the fabric shop starts stocking hographic and Escher prints, eh? Gee whiz, that’s clever. I really like the attention to detail. OMG! I LOVE this! I may have to bid on it. That is a gorgeous dress. 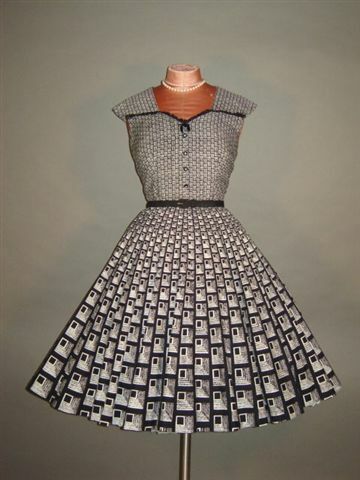 If you made the Tetris dress, you’d get lots of compliments wearing it to computer shows & science fiction conventions. I may have to figure out what that would look like for this very reason. AWESOME DRESS! The seller is also awesome, a great vintie! This was cool! And your tetris dress sounds awesome too! Oh my! That is awesome. I at first thought they were images of the ipod. LOL! ::frowns:: The item has been cancelled. Hi, this is capricornvintage. 🙂 A lovely fellow ebayer reported my item for using the word Escher in my title, so it was ended on ebay. I have relisted it. I apoligize to all of the watchers and bidders. I didn’t realize I couldn’t use a last name in the title. 😦 Thanks so much for your compliments and comments! I love this site! Wow!After relisting, this sold for over $200! Wouldn’t Cherokee strip-piecing (and much thought) work for a Tetris dress? I’d want that degree of intense color-contrast, and I think you can do strip-piecing with trapezoidal strips, although it takes even more thought. Me, I would maybe do one of the Folkwear designs instead; there’s a ?Turkish? coat made of widening strips. And then one could wear shiny boots and stride through the bridge of one’s spaceship. I think this is a GREAT idea!!! I love the dress so much!! You did a great job on it! keep up the good work! op art is imagine for life .I love it . Wow so Chick Glam! Most of my bffs would die not having it! By the way Middle School Art is doing Op-Art in class. Ask Tim Gunn how the Project Runway folks get their original fabrics made up each season. You CAN make that Tetris fabric (or pay someone with graphic design skills to create it). And when you do, I’ll be the first one in line to pay you to make me a dress with it!